Several hours before the Kansas City Chiefs' playoff victory Saturday against the Indianapolis Colts , offensive lineman Jeff Allen was stranded in the snow and needed help. That’s when a good Samaritan driving by stopped and offered to lend a hand. “I was driving down (U.S.) 40 Highway and saw a couple cars stuck," Dave Cochran said. "I pulled one car out before that, then I saw another car stuck and I told my old lady, 'We have to help him.'" Cochran, who is homeless and lives in his truck with his girlfriend and small dog, had no idea who was in the car, but he knew driving on snow-packed streets was a challenge for whoever was in the vehicle. “It said Texas plates," Cochran said. "He wasn’t used to this weather. He isn’t used to this coldness. He is from Texas." With thousands of fans flocking to Arrowhead Stadium, Allen was going to need help to get there before kickoff. Cochran may have hit a rough patch (“That is my home; my home is my truck,” he said), but it hasn't made him bitter, as he proved Saturday with the small act of kindness. After the game, Allen took to social media, hoping to track down Cochran and give him a small token of appreciation. "My car got stuck in the snow before the game & a nice guy named Dave help pull me out without knowing I was a player," he tweeted. 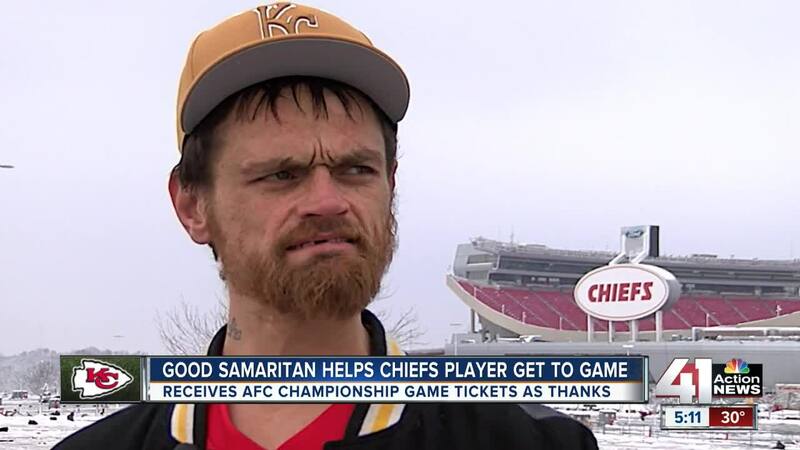 "I want to give him tickets to the AFC championship game for helping but don’t have a way to contact him. He drove a 97 or 98 Black Suburban. Pls RT #ChiefsKingdom"
It didn't take long for Allen's plea to get answered. Cochran is overwhelmed by the attention but said he didn't help for any other reason than he felt it was the right thing to do. Of course, Cochran, who said he's never been to a Chiefs game in his life, is excited for the chance to go to the AFC Championship game at 5:40 p.m. Sunday against the New England Patriots. If you would like to help Cochran, please contact 41 Action News reporter Steven Dial at steven.dial@kshb.com as he is in contact with his family.